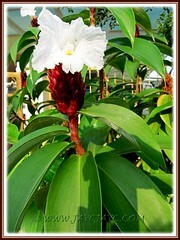 Free-flowering Cheilocostus speciosus (its current accepted name) is one of the most attractive and well-known cultivated species of the genus Cheilocostus. A lovely clustering plant with tall reed-like stems that are topped with large snowy-white and crepe-textured flowers on terminal cones. These last 4-5 years, we’ve observed them fast gaining popularity as eye-catching garden specimens or dramatic landscape plants in our neighbourhood and elsewhere. And, we never realized earlier that we’ve also grown it before in a container! What a wonderful surprise! 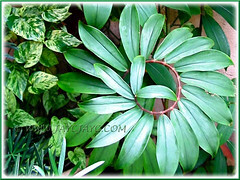 In researching to write this post, I’ve finally discovered that the NOID plant as seen in the left photo with marvelous spiral stems that sprung mysteriously in our garden in 2007 is Cheilocostus speciosus after all! Its growth pattern had fascinated us so. Some stems grew strong and upright while others would be contorted in a spiral manner at the upper end, or start in a spiral pattern but may suddenly change course and straighten undecidedly. We found this manner of stem growth weird, yet amazingly beautiful and attractive in the same breath. Etymology: Cheilo in Greek means lip, referring to its large labellum. The species epithet speciosus in Latin means good looking, beautiful, handsome, impressive, describing its appearance. Origin: Native to Malaysia, Indonesia, Papua New Guinea and other SE Asia countries, as well as Bhutan, India, Nepal and Sri Lanka, China and Taiwan. It is widely cultivated in many tropical and subtropical regions around the world and is considered a potential invasive plant in some Pacific Islands, such as Cook Islands, Fiji and Hawaii. Plant type: An ornamental herbaceous succulent plant. 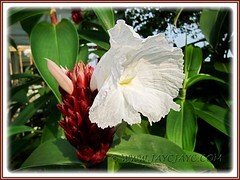 Features: Cheilocostus speciosus, a popular species among 80-100 species of plants in the Cheilocostus genus, is renowned worldwide for its medicinal value. Besides being cultivated widely as a herbal medicine in many regions, it is also favoured as an ornamental garden or landscape plant. This erect, evergreen and succulent perennial herb reproduces vegetatively by underground rhizomes and easily forms a dense clump of cane-like stems, 6-10 ft (1.8-3 m) in height. The clustering and leafy stems, green to reddish-brown in colour, are upright and unbranched, and some may occasionally contort into a lovely spiral pattern at the top-end. 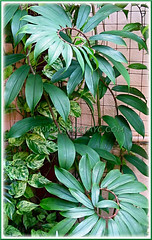 The subsessile green leaves, simple and entire, elliptic to oblong or oblong-lanceolate, 15-30 cm long and with pointed tip, silky-pubescent beneath, are spirally arranged along the stems, giving its foliage a dense appealing appearance. There is a variegated variety, C. speciosus ‘Variegated’ with fabulous leaves in bright green and creamy white. More dramatic are its snowy-white flowers. Each stem will produce a dark red or brownish-red pinecone-like terminal inflorescence, where large and showy flowers, usually 3-4 at a time, emerge from the ovate bracts. 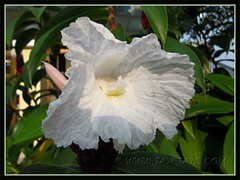 Each trumpet-shaped, frilly and crepe-like white flower, up to 4″ (10 cm) in diameter, has fused petals forming a large petaloid labellum and exposing a tiny, yellow, petal-like stamen with reflexed tip at the opening of the floral tube. 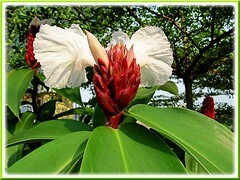 The delicate flowers seem as if made from crepe paper, hence aptly given the common name, Crepe Ginger. 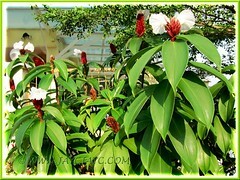 It flowers freely throughout the year in the tropics. 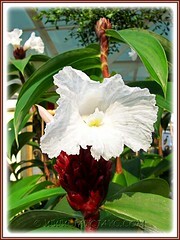 Culture (Care): Cheilocostus speciosus (syn: Costus speciosus) grows easily with minimum care. 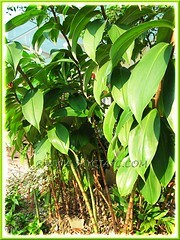 Light: Crepe Ginger prefers partial sun but grows as well in full sun if well-watered. Moisture: Water regularly and moderately. It enjoys a humid environment. Soil: Prefers fertile or humus-enriched and well-drained soil. Others: Spiral Ginger benefits from monthly feeding with a balanced fertilizer during the growing season. Sometimes the cane-like stems may need staking due to the heavy weight above. Generally it is pest and disease free. For subtropical and temperate regions: Hardiness: USDA Zone 7-12. Cheilocostus speciosus is considered the most cold-hardy of the Spiral Gingers and proven root hardy down to 0°F (-17.8°C). However, best to protect it from heavy frost or overwinter indoors with reduced water. Leaves are seasonally deciduous in cold regions. Flowers from late summer to early fall. Propagation: Propagate by division of the clumps, stem cuttings or pieces of the rhizome, that is similar in appearance to the thick fleshy ginger roots on sale at the groceries. A single rhizome is able to produce many new leafy shoots that forms a wide clump easily under favourable growing conditions. 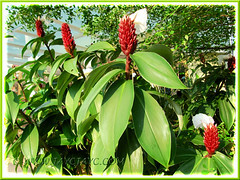 Learn how-to propagate Crepe Ginger (C. speciosus) here. 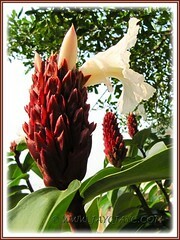 Usage: Crepe/Spiral Ginger will make excellent ornamental specimens for the garden or landscape. Grown en masse, they’ll be ideal as a tropical backdrop in perennial borders or as informal hedge and screen. It’s lovely too as a container grown feature plant at patio and deck or simply grow these clustering plants in raised planters just for its spectacular beauty to decorate entrances to shopping malls, hotels and other public buildings. 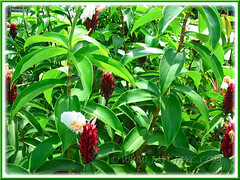 Cheilocostus speciosus is cultivated in various regions worldwide, especially in India, for its medicinal properties in traditional or ayurvedic medicines. The plant’s rhizomes, leaves and stems have different health functions and are used accordingly to treat fever, dysentery, bronchial asthma, pneumonia, rheumatism and inflammation, to name a few. The plant is used extensively in medical research and found to possess diverse number of phytochemical and pharmacological properties.